An unidentified man, said to be unconscious was reportedly abandoned by the side of the road in Lagos after a general hospital refused to admit him allegedly due to lack of bed space. 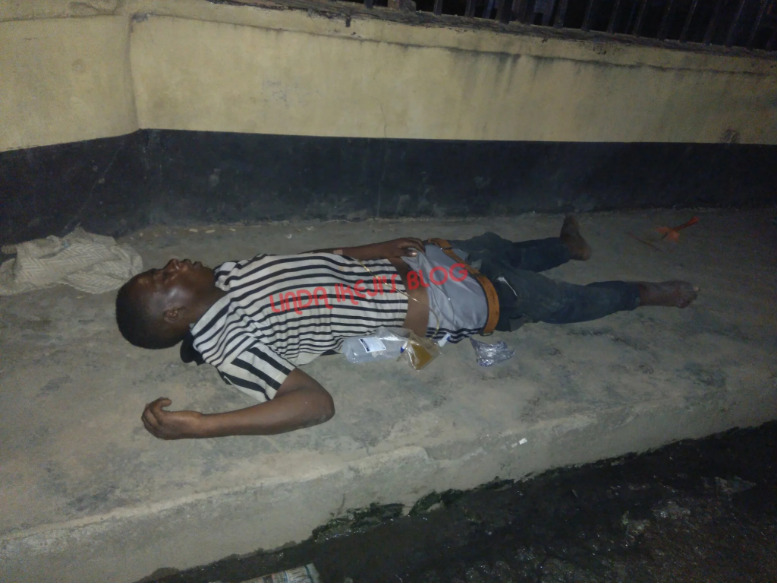 The man had Intravenous drip attached to his hand and was left unsupervised at Fagbola street, Cele Bus Stop, opposite Oando Filling Station, behind Diamond Bank, Akowonjo in Lagos state. According to an eyewitness who spoke exclusively to LIB, the man collapsed by the roadside on Tuesday afternoon and was rushed to a government hospital by passersby later that day. At the hospital, he was given first aid to resuscitate him but they refused to admit him on the grounds that there was no bed space for him. 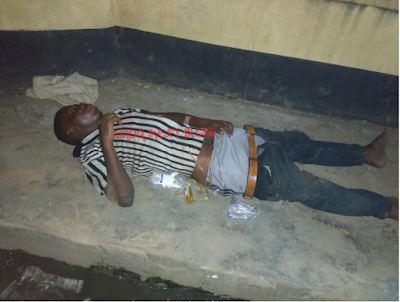 At night, at about 8 p.m., an ambulance belonging to the Alimosho local government returned him to the spot where he slumped and abandoned him there. He’s been lying on the road since yesterday. No one knows his identity or how to get across to members of his family. What's your take on this? The hospital that rejected him should at least refer him to sister hospital since we have more general hospitals in Lagos.Those clinic staff involved should be querried. What a wicked attitude displayed? If u look inside, the man might be good lagosian paying his tax regularly which was part of money used in apyingbthose wicked health workers in the hospital salary. Nigeria a country a hate with passion. Country of animals without focus and future. .a country an illiterate can be a president. Shame. And the people are mandated to pay tax, this country is a joke. Does it matter whether or not it happens abroad? There are some little things we get right in Nigeria. However, Life should not be so cheap and meaningless in Nigeria. No one deserves to be treated so inhumanly. Well articulated that the blame is on these Hospital workers who always place no value on human lives.This act of abandoning a human to die is not only shameful, it is inhuame! Animals have Hospitals in America cause ALL LIVES matter! Our people need to change this mentality! I hope that the Lagos state government should have taken the man to hospital. It's a shame on Nigeria as a nation that such issues of neglect of it's citizens in time's of such pressing need have not been addressed. May God save this country from total collapse. The patient was said to have been given first aid at the hospital which is the least they can do if they have no bedspace and am sure he definitely must have been referred to a sister general hospital by the doctor who attended to him since they had no bedspace. No general hospital will refuse to admit a patient if there is bed space. The officials of the ambulance services that returned the patient back to the site where he slumped are at fault. Why should they return the man back to the street. If there is no bedspace in one general hospital then, they should have taken him to another general hospital/LASUTH/LUTH until they get bedspace for the patient. Most of the Govt owned hospital are over filled with patients at the moment.